All Engel fridge/freezers feature the Engel Swing Motor Compressor. Highly efficient, it typically draws around 1 to 2 Amps per hour (check the specs below), about 40% less than a traditional compressor. 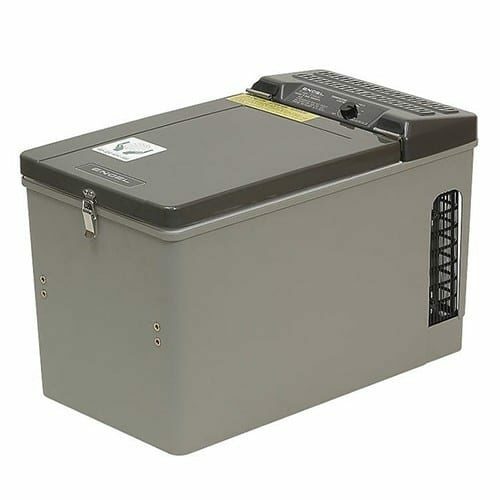 Engel fridge/freezers run on battery power (12V/24V DC) or 110V/120V AC, so whether you’re on the road, on the water or safe at home, you can use your Engel to make life a little easier. Will Operate 90 Degrees (F) From Ambient Temp. Mr.Chuzo Sawafuji,the first president of the company,founded SAWAFUJI ELECTRIC MANUFACTORY at Kitamachi, Ushigome,Shinjuku-ku,Tokyo in 1908. At Sawafuji Electric, the corporate philosophy is to create solid products, fulfill our corporate social responsibilities, and fill the lives of all involved in these processes with prosperity. SawaFuji have been in business for over 100 years, ceaselessly refining the expertise upon which we do business. SawaFuji` central products; electronic components for trucks and buses, portable electronic equipment and portable refrigerators, have been exported to over 100 countries and are the choice products of consumers in Japan and all around the world. Visit us on Facebook as well or join our ZEROhomebills Community. BEST Products from the BEST Brands at the BEST Prices available in your market. Special prices for bulk purchase. SHOP and REDUCE your home and utility bills to ZERO with our products and services. BEST products, from the BEST brands at BEST prices available. SHOP and REDUCE your home and utility bills now with Solaranna. SHOP and REDUCE your home and utility bills to ZERO with our products and services. Follow us on Twitter. BEST products, from the BEST brands at BEST prices available. SHOP and REDUCE your home and utility bills now with Solaranna. Find us on Facebook. SHOP and REDUCE your home and utility bills to ZERO with our products and services. BEST products, from the BEST brands at BEST prices available. SHOP and REDUCE your home and utility bills now with Solaranna.